News Belongs To You And Your Friends On GONG! KillerStartups > Startup Reviews > News Belongs To You And Your Friends On GONG! The days of turning directly to a news source for the news are long gone. We still tune in to our radios and TVs, our newspapers may have made the leap from print to online, but each of us has different channels for absorbing what’s happening in our world. This is both wonderful and chaotic. We have new social platforms for learning news, with every kind of angle imaginable – which helps us to connect with events. There are so many different voices with different perspectives we can choose to listen to or ignore. We can talk about news, riff on the news – and have our unique take on things actually heard! If you have a hard time finding interest in news, chances are it’s because you don’t care. Or, you’re completely confused about where to turn. GONG!, like “the reverberating sound waves that are created when striking the magical musical instrument,” wants to provide everyone a resonant experience of the news. GONG! is a place for discovering and sharing news – by way of stories pulled from any source, that have been overlaid with GIFs, comments, or whatever will make headlines among like-minded others. Their mission is simple: “We want to make news fun, outrageous, emotional, and a truly engaging, personalized experience.” The creators of GONG! don’t believe you should have to sift through social media to find what truly matters to you. They understand that the content you care about is buried by too many sources or packaged boringly, stupidly. Having real conversation is… well, no one really is sure what that looks or feels like anymore. GONG! aims to strike all the right chords at the right times. Members can share publicly or privately. It’s a way to express yourself with brevity, wit, humor. Through GONG!, users can engage with what’s being talked about without getting sucked into lifeless, repetitive news cycles. GIFs humanize the news and make stories more accessible among friends. Yes, we should be able to have our cake and eat it too – to find snippets of the news that still manage to speak to us. To weigh in on what’s trending without vanishing into a trending vortex. 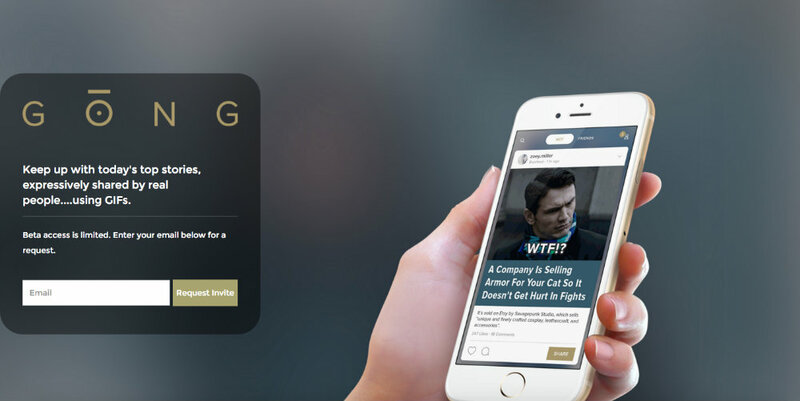 Find news you care about on GONG! Make headlines so that stories will truly come alive for you and your friends. Keep up with what’s going on and FEEL something again.